Gelatin is a colorless, tasteless and odorless substance that comes from collagen, a protein found in fibrous skin tissue. All animals have collagen and it’s the most abundant protein in mammals. When animal skin is boiled, the collagen in the tissue is chemically broken down into semisolid gelatin. The use of gelatin dates back 8,000 years ago, when early humans used it as a glue and protective lining on their baskets and fabrics. Millennia later in the 15th century, gelatin became a fashionable delicacy. Since it takes on the taste of whatever is added, gelatin was prepared with meat, vegetables and fish. And it was so versatile that it was even used as rudimentary packaging that helped slow spoilage. Over the next several centuries, gelatin-based desserts grew in popularity and, perhaps surprisingly, as a status symbol. “Jelly,” made by adding sugar to gelatin and a sweet or spicy ingredient, became the most popular rendition, with a recipe first appearing in Hannah Glasse’s 18th century guide The Art of Cookery. However, while gelatin desserts were popular, they were time-consuming (and rather disgusting) to make. But in 1845, famed inventor (builder of the first American steam locomotive) Peter Cooper patented his “Portable Gelatin,” a powdered, premade version that he sold to cooks. Fifty years later, cough-syrup-maker Pearle Wait, from the small town of Leroy, New York (where, today, there's a Jell-O museum), bought the patent. He added sugar and food coloring to it and his wife gave it the much catchier name “Jell-O.” Despite their efforts marketing it door to door, sales were poor and, two years later, Wait sold the patent for $450 to fellow townsman Orator F. Woodward. That turned out to be a big mistake. Success didn’t come quickly for Woodward either, despite incorporating the product into his Genesee Pure Food Company. At one point, he, like Wait, attempted to rid himself of Jell-O by selling the entire enterprise to a neighbor for only $35. Luckily for Woodward, that neighbor refused. Woodward tapped into the power of advertising to reverse Jell-O’s fortunes. He took out an ad for the languishing product in the nationally syndicated Ladies Home Journal. Featuring a nicely dressed woman in an apron saying that Jell-O was America’s favorite dessert, it appealed to a growing new market: housewives. The ad spiked sales and future advertising continued to aim at this particular customer. 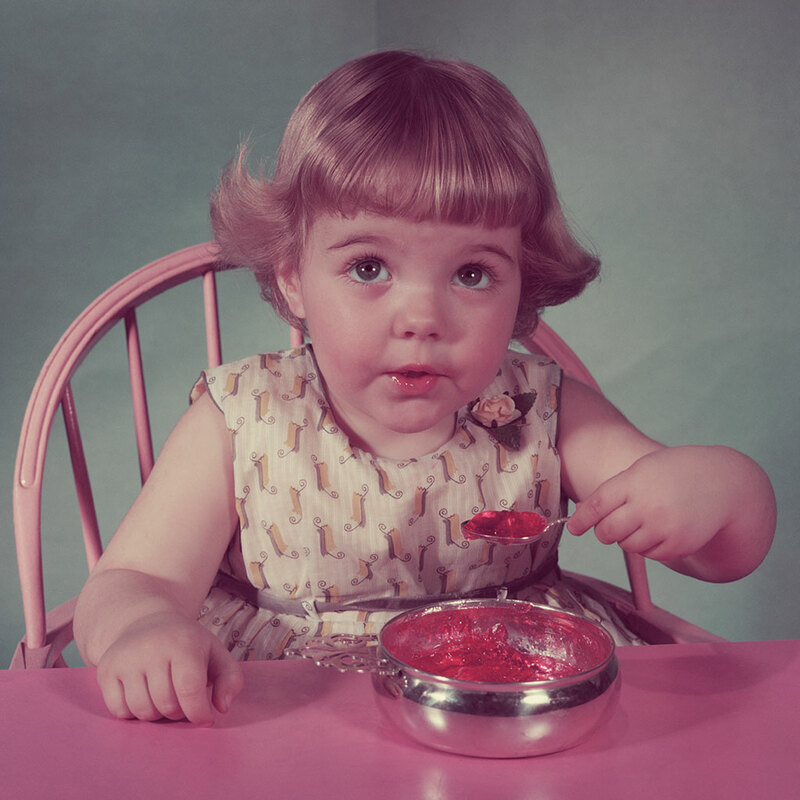 Great marketing would be at the heart of Jell-O’s popularity throughout the 20th century. Free Jell-O was given out to immigrants as they arrived at Ellis Island. The company hired a young Norman Rockwell to do beautiful illustrated ads featuring a little girl serving Jell-O to her doll. In the 1930s, they sponsored radio programs—starring comedian Jack Benny—at a time when the medium was still relatively new. Around that same time, the famed New York ad agency Young & Rubicam debuted their “J-E-L-L-O” jingle. And in 1974, 37-year-old comedian Bill Cosby was hired to be the celebrity spokesperson for Jell-O’s new pudding line. He would endorse for Jell-O for 25 years, making the relationship between the two one of the most iconic in American history. Today, those 1970s Cosby-starring commercials are pretty uncomfortable. While Jell-O sales are not what they used to be (although green Jell-O is still quite popular in Utah), the little boxes can still be found in grocery stores worldwide. And for those a bit grossed out about eating boiled animal hides for dessert, scientists are now working on a new way to make gelatin: boiling human skin. Enjoy, all you cannibals.